I tell the story of all the amazing ministry unfolding at Advent through our website, e-letters, social media, print and other mediums. I seek to abundantly inform everyone at and beyond Advent about the events, groups, and opportunities for them here, and to make the channels of getting involved welcoming and intuitive. I also work with our junior high and high school youth on faith development, communications projects, service projects and more. I believe communications is ministry. It has immense potential to connect our community and deepen faith every day, regardless of where we are. It provides opportunities for us to turn outward -- into our streets and to the world through the Internet -- to share the gospel of radical love, and invite others to be part of our community and our work toward healing, togetherness, and justice. I also believe teenagers bring incredible insight to faith and the world, can make a meaningful impact on their community by leading, working together, and sharing their talents and perspectives. I want to help them make that happen. I moved to New York City from the suburbs of California to be enlightened and inspired by people who come from different life experiences, cultures, and perspectives than mine. And indeed in the city I was surrounded by such people -- but only surrounded. Advent is the place I came to really know very different people in a real community: people old and young, people speaking English and Spanish, people who have lived in the city their whole life and first-generation immigrants from China, Germany, Ghana, and the Dominican Republic. The people I have come to know at Advent have expanded my perception of the world, made me a better person, and continue to inspire me immensely. Anything you want the rest of our community to know about, faith & ministry stories, our website, our e-letters, any questions you have about events, ministries, or how to get involved at Advent, our Confirmation program, and our high school youth group. Also, music (new and old), music production, writing, photography, design, art, inspiring stories, books that change the way you think about the world, how the ways we interact with music are changing in the digital age, great movies and TV shows, creativity, and innovation. Writing and producing music, playing guitar, at a concert, exploring the city with my camera, relaxing with my dogs in my backyard, or out and about with my friends. Kevin grew up in Thousand Oaks, California, where he attended Ascension Lutheran Church and played music with his friends in a band called Vannuys. (Yes, their MySpace page is still alive and well.) He attending California Lutheran University from 2008-2012, earning a Bachelor's degree in English. During that time he also worked as a Marketing/Graphic Design Intern at the Student Life Office, Music Editor for the Morning Glory literary journal, and spent two summers as a camp counselor with Lutheran Retreats, Camps, and Conferences. Kevin moved to New York in 2012 to pursue a Master's degree in English Education at The City College of New York, with aspirations of one day becoming that sort-of cool high school English teacher. He joined Advent as our Middle and High School Youth Director in 2013. 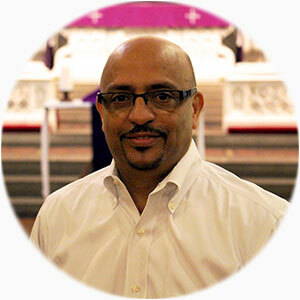 He completed a Master of Arts degree in English Education at The City College of New York in May 2014, but instead of going into teaching, he felt called to continue youth ministry and absorb the role of Communications Director at Advent. His high school/college band, Vannuys, went on to play the ELCA Western States Youth Gathering in Anaheim in 2011 and the ELCA National Youth Gathering in New Orleans in 2012. When he's not working at Advent, Kevin writes, produces and performs music in the city at venues like Rockwood Music Hall, C'mon Everybody, and a Bushwick speakeasy.